Osmania University is scheduled to conduct Osmania University Common Entrance Test (OUCET) 2018 from 4th to 13th June 2018. A huge number of candidates who are looking for the admissions into various PG (Science, Commerce, Education, Arts & Social Sciences), PG Diploma and 5-year Integrated Programs offered by Osmania, Telangana, Mahatma Gandhi and Palamuru Universities applied for the exam. Candidates who had applied are searching for the OUCET Hall Ticket 2018. Osmania University is going to release CET Hall Ticket today. The Candidates can download hall tickets from the direct link provided below. Osmania University is a public state university located in Hyderabad, India. The OU is one of the largest university systems in the subcontinent with over 300,000 students on its campuses and affiliated colleges. It is particularly known for its faculty of Engineering and Technology, Law, Arts, Sciences, Commerce and Management departments. Osmania Medical College was once a part of the university. It conducts various examinations for the admissions into various programs. This year it has released notification for the OUCET exam and the candidates who had applied for the exam can download hall ticket from the official website. Osmania University Common Entrance Test (OUCET) Admit Cards will available from 1st June 2017. Candidates who had applied in the given time can download the admit card from the direct link provided below. Without admit card the candidates will not be allowed to write the examination. So, the candidates are advised to download the admit cards online from the official website. The entrance test in all the subjects (except M.P.Ed.) will comprise of 100 multiple choice questions. Each question will carry 1 mark, hence the maximum marks will be 100. The entrance test for M.P.Ed. will have 75 questions (1 mark each), while remaining 25 marks will be awarded by the Department of Physical Education, Osmania University for the Sports Achievements of the candidates. For M.Sc. Biochemistry, Biotechnology, Environmental Science, Forensic Sciences, Genetics, and Microbiology will be divided into two parts. The first part – Part A (Chemistry) will be of 40 marks, while the second part (Part B) will be one of the optional subject studies at B.Sc. Level and will be for 60 marks. 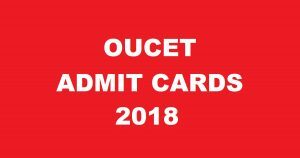 Click on OUCET 2017 Admit Card. Stay tuned to this website. 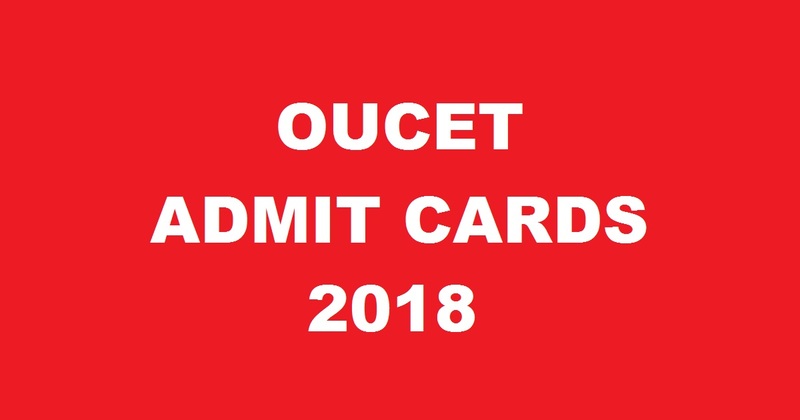 We will update OUCET Answer Key 2018, Results here. Press CTRL+D to bookmark this page for easy navigation.